A-HOTEL.com - Luxury and cheap accommodation in Ozerki, Russia. Prices and hotel, apartment booking in Ozerki and surrounding. Boasting a bar, Gostinitsa Grez is located in Barnaul, 15 km from Avalman Ski Lift 1. The property is situated 15 km from Avalman Ski Lift 2 and 15 km from Avalman Ski Lift 3. Hotel Palma features free WiFi and rooms with air conditioning in Barnaul. The property is around 14 km from Avalman Ski Lift 1, 14 km from Avalman Ski Lift 2 and 14 km from Avalman Ski Lift 3. Apartment on Prospekt Lenina offers accommodation in Barnaul. The kitchen comes with a microwave and a fridge and there is a private bathroom. Set 13 km from Avalman Ski Lift 1 in Barnaul, Апартаменты на Северо-Западной 29 offers accommodation with a kitchen. This apartment features accommodation with a balcony and free WiFi. Apartament (красная линия), a property with a terrace, is located in Barnaul, 12 km from Avalman Ski Lift 1. The air-conditioned accommodation is 12 km from Avalman Ski Lift 2. Located 16 km from Avalman Ski Lift 1, 16 km from Avalman Ski Lift 2 and 16 km from Avalman Ski Lift 3, квартира offers accommodation set in Barnaul. Free WiFi is featured. Offering free WiFi and a shared lounge, Hostel Podsolnuh is located in Barnaul, 12 km from Avalman Ski Lift 1. Built in 2015, the property is within 12 km of Avalman Ski Lift 2. Situated in Barnaul, 13 km from Avalman Ski Lift 1, Hotel Chaika features a garden and a terrace, as well as free WiFi. The property is set 13 km from Avalman Ski Lift 2 and 13 km from Avalman Ski Lift 3. Set in Barnaul and within 14 km of Avalman Ski Lift 1, Shokolad Hotel has a shared lounge, non-smoking rooms, and free WiFi. The property is around 14 km from Avalman Ski Lift 2 and 14 km from Avalman Ski Lift 3. Set 16 km from Avalman Ski Lift 1, 16 km from Avalman Ski Lift 2 and 16 km from Avalman Ski Lift 3, Apartment on Antona Petrova features accommodation located in Barnaul. The accommodation has free WiFi. 12 km from Avalman Ski Lift 1, Hotel Business-Tourist is located in Barnaul and offers free WiFi and express check-in and check-out. 12 km from Avalman Ski Lift 2, the property is also 12 km away from Avalman Ski Lift 3. Set 15 km from Avalman Ski Lift 1 in Barnaul, Квартира посуточно ЛЮКС offers accommodation with a kitchen. It is located 15 km from Avalman Ski Lift 2 and features free WiFi. Situated in Barnaul, within 11 km of Avalman Ski Lift 1 and 11 km of Avalman Ski Lift 2, Hotel Prestige offers free WiFi. All rooms boast a flat-screen TV with satellite channels and a private bathroom. Featuring a shared lounge, Globus Hostel is located in Barnaul, 11 km from Avalman Ski Lift 1. The property is situated 11 km from Avalman Ski Lift 2 and 11 km from Avalman Ski Lift 3. 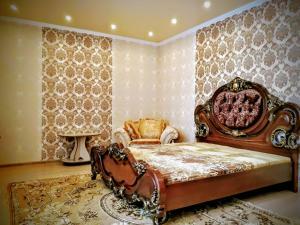 Mini-Hotel Jan is set in Barnaul and features free WiFi and a 24-hour front desk. At the inn, rooms come with a wardrobe. 13 km from Avalman Ski Lift 1, Вояж is situated in Barnaul and features a bar and free WiFi. The property is located 13 km from Avalman Ski Lift 2 and 13 km from Avalman Ski Lift 3. Brightly decorated rooms with free Wi-Fi are offered at this modern hotel, located in Barnaul’s city centre. It features a small indoor pool with sauna, a breakfast hall and a games room. Апартаменты на Свердлова 73 is set in Barnaul, 11 km from Avalman Ski Lift 1, 11 km from Avalman Ski Lift 2, and 11 km from Avalman Ski Lift 3. This apartment also features free WiFi.